Place beef in slow cooker. In a medium bowl, mix together beef broth, soy sauce, brown sugar, garlic, sesame oil, ginger and onion powder. Pour over beef. Cook on low for 8-9 hours, until the meat shreds easily with a fork. Once cooked, remove from slow cooker and shred with a couple of forks. 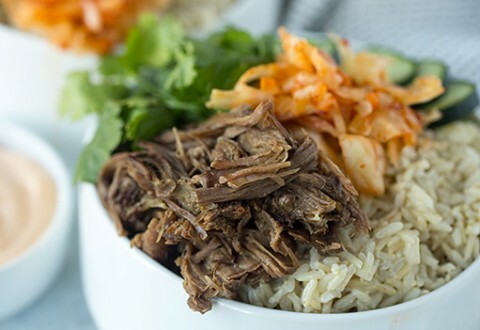 Add about ½ cup of the liquid from the slow cooker to the beef to give it all that good flavor. Make the sriracha mayo by mixing together mayonnaise, Greek yogurt, milk and sriracha. Assemble burrito bowls by placing rice, cucumbers and beef in a bowl. Top with cilantro, kimchi and sriracha mayo. Serve and enjoy!